After some intensive research, I was able to compile the below evidence may clarify some of the assumed history of Barry & Patten. Below is an ad that ran in the Daily Alta from July 16, 1858 through November 8th, 1858 in which a 'half bottle' is promoted. I can't help but want to believe this is the legendary face embossed Barry and Patten cylinder. Based on the below information, the 116 & 118 address was only used from 1855 through most of 1858. Around early September of 1858 they moved to the south East corner of Montgomery and Sacramento (the 400 block) and then on September 23rd changed their Daily Alta ad to reflect the new address. Barry & Patten moved once again in the spring of 1864 to their third and final location of 413 Montgomery. July 20th 1878 was the end of the fabled Barry & Patten partnership as evidenced by the below sheriff's auction of their property. What is the general consensus on the age of the shoulder embossed versus the face embossed bottles ? These advertisements and city directory listings suggest that the face embossed variant is the newest variant. What throws me off is the fact that there are supposedly smooth base shoulder embossed variants, but how can that be possible if the shoulder embossed 114 & 116 Montgomery variant has to be in the 1853-1855 range ? 1855: Barry & Patten, saloon, 116 and 118 Montgomery (from Daily Alta, no available 1855 directory). 1857: Barry & Patten, saloon, 116 and 118 Montgomery (from Daily Alta, no available 1857 directory). 1858: CALIFORNIA METALLURGICAL WORKS.— 114 Montgomery. Wow! I have never seen these bottles and Im in love! Just beautiful stuff there... its so interesting to see the eastern glass with the western style on the face embossed variant. I would agree the shoulder embossed bottle is older by glass manufacturing standards. The embossing of course had to be on the shoulders in a three piece mold, which was a common use in the 1850's where as it seems to have lost appeal into the 60's. It wouldn't be until the 1860's and even 70's that the two piece mold whiskey cylinder became standard use making it easier to face emboss the bottles. 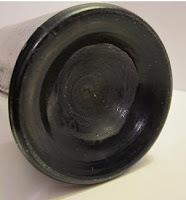 There are however Iron pontiled cylinders from doyttville in the 1850's in a two piece mold, so it was being used. There seems to be evidence of eastern glass houses using the snap case as early as the 1850's also. Its possible that when the mold changed the manufacturer also changed, the new manufacture having not yet adopted the snap case while the old manufacturer had in the course of production.